Serving Dare County for Over 60 years . 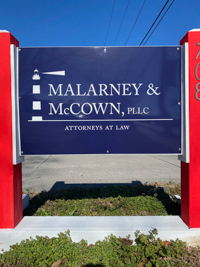 . .
As one of the first legal firms founded on the Outer Banks, McCown & McCown, P.A. is a well-established and reputable firm offering legal advice and services in a variety of areas. Attorney Linda McCown’s main areas of practice include Commercial and Residential Real Estate Transactions, Estate Planning & Administration, Traffic Infractions, Divorce, and Contracts. located on the main thoroughfare of Manteo immediately between the Island Guest House and Ron & Phil's Body Shop, across from the Manteo Elementary School in Manteo, NC, McCown & McCown practices throughout Dare, Currituck, Tyrrell, Pasquotank, Camden, Beaufort and Hyde Counties. Contact McCown & McCown, P.A. today for a trustworthy local attorney who will suit all your Outer Banks legal needs.